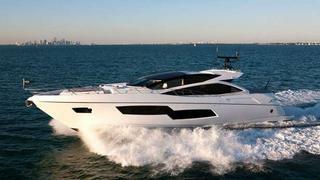 A call to Sunseeker London brings news that they have a 24.89m Sunseeker Predator 80 available for immediate delivery. Built in 2013, she's fitted with twin 1950hp MTU 12V 2000 M94 engines which propel her to speeds of 35/6 knots. The interior is furnished with light Anegre satin wood, luxury Wenge flooring and a Ken Freivokh design. She accommodates eight guests in four cabins, with a further two crew berths. Full of innovative design features unique to the Sunseeker Predator 80, the yacht boasts expansive hull windows that stretch from the aft master cabin to the galley and a glass bridge with a touch screen dashboard. Her price is available on application.